Gustav IV Adolf or Gustav IV Adolph (1 November 1778 – 7 February 1837) was King of Sweden from 1792 until his abdication in 1809. He was also the last Swedish ruler of Finland. The occupation of Finland in 1808-09 by Russian forces was the immediate cause of Gustav's violent overthrow by officers of his own army. Following his abdication on 29 March 1809, an Instrument of Government was hastily written, which severely circumscribed the powers of the monarchy. The "Instrument" was adopted on 6 June 1809, a date which is celebrated to this day as the National Day of Sweden. It remained in force until replaced in 1974. The crown (now with strictly limited powers) passed to Gustav's uncle, Charles XIII, who had no children; this want of heirs set into motion the quest for a successor, who was found the following year in the person of Jean-Baptiste Bernadotte, the first monarch of the present royal family. Gustav Adolf was born in Stockholm. He was the son of Gustav III of Sweden by his wife queen Sophia Magdalena. His mother, Sophia Magdalena, was eldest daughter of Frederick V of Denmark and his first wife Louise of Great Britain. It was rumored at the time of his birth that Gustav Adolf was the biological son of a Finnish nobleman, Count Adolf Fredrik Munck af Fulkila (at that time a Baron rather than a count), though this has never been established. Gustav Adolf was under the tutelage of Hedvig Sofia von Rosen and her deputies Brita Ebba Celestina von Stauden and Maria Aurora Uggla until the age of four. He was then raised under the tutelage of his father and the liberal-minded Nils von Rosenstein. 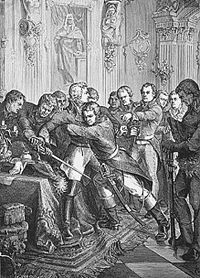 Upon Gustav III's assassination in March 1792, Gustav Adolf succeeded to the throne at the age of 14, under the regency of his uncle, Charles, duke of Södermanland, who was later to become King Charles XIII of Sweden when his nephew was forced to abdicate and flee the country in 1809. In August 1796, his uncle the regent arranged for the young king to visit Saint Petersburg. The intention was to arrange a marriage between the young king and Grand Duchess Alexandra Pavlovna, a granddaughter of Catherine the Great. However, the whole arrangement foundered on Gustav's unwavering refusal to allow his intended bride liberty of worship according to the rites of the Russian Orthodox Church. Nobody seems to have suspected the possibility at the time that emotional problems might lie at the root of Gustav's abnormal piety. On the contrary, when he came of age that year, thereby ending the regency, there were many who prematurely congratulated themselves on the fact that Sweden had now no disturbing genius, but an economical, God-fearing, commonplace monarch. Gustav Adolf's prompt dismissal of the generally detested Gustaf Adolf Reuterholm, the duke-regent's leading advisor, added still further to his popularity. On 31 October 1797 Gustav married Friederike Dorothea, granddaughter of Karl Friedrich, Margrave of Baden, a marriage which seemed to threaten war with Russia but for the fanatical hatred of the French republic shared by the Emperor Paul of Russia and Gustav IV Adolf, which served as a bond between them. Indeed, the king's horror of the cancer of Jacobinism was intense, and drove him to become increasingly committed to the survival of Europe, to the point where he postponed his coronation for some years, so as to avoid calling together a diet. Nonetheless, the disorder of the state finances, largely inherited from Gustav III's war against Russia, as well as widespread crop failures in 1798 and 1799, compelled him to summon the estates to Norrköping in March 1800 and on 3 April the same year. When the king encountered serious opposition at the Riksdag, he resolved never to call another. His reign was ill-fated and was to end abruptly. In 1805, he joined the Third Coalition against Napoleon. His campaign went poorly and the French occupied Swedish Pomerania. When his ally, Russia, made peace and concluded an alliance with France at Tilsit in 1807, Sweden and Portugal were left as Great Britain's European allies. On 21 February 1808, Russia invaded Finland, which was ruled by Sweden, on the pretext of compelling Sweden to join Napoleon's Continental System. Denmark likewise declared war on Sweden. In just few months after, almost all of Finland was lost to Russia. As a result of the war, on 17 September 1809, in the Treaty of Hamina, Sweden surrendered the eastern third of Sweden to Russia. The autonomous Grand Principality of Finland within Imperial Russia was established. Gustav Adolf's inept and erratic leadership in diplomacy and war precipitated his deposition through a conspiracy of army officers. On 7 March 1809, lieutenant-colonel Georg Adlersparre, commander of a part of the so-called western army stationed in Värmland, triggered the Coup of 1809 by raising the flag of rebellion in Karlstad and starting to march upon Stockholm. To prevent the King from joining loyal troops in Scania, on 13 March 1809 seven of the conspirators led by Carl Johan Adlercreutz broke into the royal apartments in the palace, seized the king, and imprisoned him and his family in Gripsholm castle; the king's uncle, Duke Charles (Karl), was thereupon persuaded to accept the leadership of a provisional government, which was proclaimed the same day; and a diet, hastily summoned, solemnly approved of the revolution. On 29 March Gustav IV Adolf, to save the crown for his son, voluntarily abdicated; but on 10 May the Riksdag of the Estates, dominated by the army, declared that not merely Gustav but his whole family had forfeited the throne, perhaps an excuse to exclude his family from succession based on the rumours of his illegitimacy. A more likely cause, however, is that the revolutionaries feared that Gustav's son, if he inherited the throne, would avenge his father's deposition when he came of age. On 5 June, Gustav's uncle was proclaimed King Charles XIII, after accepting a new liberal constitution, which was ratified by the diet the next day. In December, Gustav and his family were transported to Germany. In 1812, he divorced his wife. In exile Gustav used several titles, including Count Gottorp and Duke of Holstein-Eutin, and finally settled at St. Gallen in Switzerland where he lived in a small hotel in great loneliness and indigence, under the name of Colonel Gustafsson. It was there that he suffered a stroke and died. At the suggestion of King Oscar II of Sweden his body was finally brought to Sweden and interred in the Riddarholmskyrkan. Crown Prince Gustav, after 1809 known as Gustaf Gustafsson, Prince of Vasa (9 November 1799 – 1877). He served as an officer in the service of the Habsburgs of Austria, and with his wife Princess Louise Amelie of Baden, fathered a son who died in infancy, and a daughter, Carola, the wife of King Albert of Saxony. She died childless. Princess Cecilia (22 June 1807 – 1844), married Augustus, Grand Duke of Oldenburg, and had issue. By 1812, Gustav Adolf divorced his consort, and following this he had several mistresses, among them Maria Schlegel, who gave him a son, Adolf Gustafsson (1820-1907). Wikimedia Commons has media related to Gustav IV Adolf of Sweden. Bain, Robert Nisbet (1911). "Gustavus IV." . Encyclopædia Britannica (11th ed.). "Gustavus IV. Adolphus" . New International Encyclopedia. 1905. "Gustavus IV., Adolphus" . The American Cyclopædia. 1879.